While the rain pelts down in South America, southern Africa is struggling with a worsening drought. The FAO has lowered its production outlook. The El Nino has meant drier conditions, which particularly affect small-scale producers who are entirely dependent on rainfall to sow their crops. Production was already low last year, leading to higher food prices, so food shortages are expected in 2016. The UK is likely to have it's mildest December on record. As at 24 December, the mean so far for December was 8.1 °C, which is 4.2 °C above the long-term average for the month. The previous record was in 1934, and was 6.9 °C. Parts of the UK have also had record-breaking rainfall. Right now there are "nightmare" floods in much of York and Lancashire. The River Aire in Leeds has burst its banks and reportedly risen to the highest level ever recorded. This after the dreadful floods in Cumbria and elsewhere just a short while ago. On the Great Ocean Road, a bushfire destroyed much of the small towns of Wye River and Separation Creek, with at least 116 homes burnt to the ground. The fire is said to have been caused by lightning, and came after some unusually hot Christmas weather. Even the seaside resort town of Lorne was evacuated at Christmas. The townships are on the Great Ocean Road, one of the wonders of the world and a favourite holiday destination over the summer months. Meanwhile, up north in the Daly River floods, residents were warily watching out for crocodiles as they escaped to the highest ground around. I understand that southern California can get wildfire all year around, but it still surprised me when I read that a major highway was closed and people evacuated because of a wildfire in Ventura County. It was said to have been caused by arcing power lines, and fanned by northerly winds. In Missouri and New Mexico, USA, a State of Emergency has been declared. At least 43 people have reportedly died in the storms so far from floods and tornadoes lashing the US South, Southwest and Midwest. Weather reports warn of continued flooding rains, blizzards and tornadoes. In Missouri eight people have died and 180 roads have been closed - due to widespread flooding. And there is more to come. December got some record-breaking warmth across much of the USA and Canada. Toronto had the warmest Christmas Eve on record. South Florida is calling a heat wave. What is causing the weather extremes? From some of the worst floods ever known in Britain, to record-breaking temperatures over the Christmas holiday in the US and forest fires in Australia, tumultuous recent weather events are likely to be down to the natural phenomenon known as El Niño making the effects of man-made climate change worse, say atmospheric scientists. That's probably why you don't read much about the weather on climate conspiracy blogs. Science denying blogs like WUWT (supposedly run by an ex-weather forecaster) cannot reconcile the weather with their current claims of global cooling, so they ignore it altogether. On the Guardian web pages, in response to the NW England floods, there was the usual denier stuff about how weather is not climate. Apparently, there is only a one way link between the two: weather -> climate. Nothing, absolutely nothing, will penetrate the denier mindset. They just become ever more ludicrous in what they say. But if I thought the Cumbrian people had it bad, at least unlike the victims of the Northern Territories floods, they didn't have Saltwater Crocs to contend with. Now that takes it to another level. Even if half the land surface was flooded and the rest in drought and/or burning up, science deniers would still be saying that we're about to be plunged into an ice age. All that's left in deniersville are at the extreme end of nuttery. In the last week or so she's Steeled and Worrelled so it's only a matter of time before she Balls. OT. Tamino has just taken down Lindzen re his defence of the diminished Dyson. The comments are just as interesting. In the past couple of weeks, since she Ted Cruz'd, she's also Pat'n Chipped, and Anthony Watts'd, and Krummered, and Franktoo'd. And they are the copy and paste articles, not just some of the things that caught her eye (which include links to WUWT, Paul Homewood and other denialist blogs). Is it possible the fossil fuel industry would not want to pay her for her (entirely unrelated) Hurricane forecasts, if she stopped posting denialist crap? I doubt that money is at the root of Judith's disinformation drive. I think she just feels more comfortable among conspiracy nutters, what she sees as fellow contrarians but are actually more like Lizard Men believers. From things she's let slip, I've gathered that she started out looking for her lost (and fleeting) fame and knew she couldn't make the grade with science. In other words, I think it's just adoration she's after, and since she can't get it from her peers or the general public, she's happy to get it from the utter nutters, the dregs of society. She's a middle sized fish in a small dank pond. Ah yes, Henk - this December is set to arrive at position #24 of Aprils as of 1901... That is, it would count as a quite warm month of April. In Belgium, as of today, december is 5.9°C above the 1980-2010 average, 2.3°C over the last record of 1934! And the weather station at Uccle (Brussels) is one of the world's longest running with records going back to 1833. Holland, de Bilt, December average minimum temperature projected to come out at +7.54° C.
Record daily average, 1974, was +7.3° C.
Always knew I arrived on some wrong planet. And X-Mas destroyed every statistic of more than three centuries, of course. It was eerie. The Netherlands (just north of Belgium) also passed its record by more than 2°C. Just like Belgium. This global conspiracy must be so much work to coordinate. France the same. It was 16°C in my father's garden in Normandy. Flowers began to bloom on cherry trees. A bad omen for crops. When low temperatures (and maybe even record lows, if the jet stream is as weak as now and we run out of luck) will strike, we will have tremendous losses. We've got some bloom on a climbing rose, which is just mad in December. Also some campanula are flowering. All wrong and frankly, disturbing. Same in Germany, many plants think it is spring already. When frost comes there will be huge damages. Conveniently, Julia has completely changed her tune this month and decided that climate change will mean that "an extended period of extreme UK winter rainfall is now seven times more likely than in a world without human emissions of greenhouse gases"
It seems to me that Julia is trying to blame climate change for any weather that the UK happens to be experiencing at that moment in time, even if it completely contradicts what she has said in the past. Sou, will you be contacting Julia for a clarification/apology? We all know that short term climate prediction is very hard, especially in Europe. Does not say anything about long-term projections. Keep trolling. Did you actually read the article you cite? It discusses the effect of long term arctic ice loss on climate in the UK but also "stressed that it was one factor and not the 'dominant driver' in the UK." Methinks YOU are the one who should be considering isuing a "clarification/apology" over taking a single out of context statement and presenting it as something it is not. You do know that everyone here is well aware of this old denier tactic, do you not? That said, why don't YOU email Dr. Sligo and see what she says? That might be a little more mature than engaging in your little bit of innuendo about how ignorant or whatever you think she is compared to you. "But she stressed that it was one factor and not the "dominant driver" in the UK." I assume you are just trolling, Andrew Wilkins. Or do you really think your comment added something to the discussion? I applaud Andy Wilkins for his acceptance that Watts, Goddard, et al have been telling porky pies about Arctic Sea Ice decline. "Julia Slingo told us in 2012 that UK winters would be drier and colder"
No she did not. Andy is employing the standard fake skeptic "gotcha" technique where observations are turned into predictions. She went on to explain that "colder winters also tend to be drier as snow has less water content than rain." Interestingly, the 2011 research that she was citing was co-authored by Judith Curry. "We conclude that the recent decline of Arctic sea ice has played a critical role in recent cold and snowy winters." Curry even has a post about it. But don't expect to hear "Judith Curry told us in 2011 that UK winters would be drier and colder" from the climate cranks - no doubt that paper has already been tossed the memory hole. Links to such blogs are not allowed here. Links to a graph, without a text that explains how it was computed is pseudo-science by definition. It appears to come from Stephen Goddard, which makes it immediately suspect. At least he simply says it was warmer on average in the US on the one single day, Christmas Eve, 1955 than in 2015, though knowing his track record it wouldn't surprise me if even that single-day cherry-pick was incorrect. "It was warmer in the US on one day in 1955"
This thing that you're doing, it's what intelligent people call a logical fallacy. I'll spell that for you: L-O-G-I-C-A-L F-A-L-L-A-C-Y. It occurs when people make mistakes in their attempts at deductive or inductive reasoning. This flawed thinking is particularly prevelant in immature thinkers, or in people who are untrained in rational analysis. "Weather" is a set of values for meteorological parameters in a specific location at a specific time. On occasion such parameters, for example the temperature or the amount of rainfall, can reach extreme values that become records for that location. "Climate" is the averaged values for meteorological parameters in a more regional location over multi-year intervals of time. Your first logical fallacy was to confabulate weather with climate. You cherry-picked a particular extreme historical weather event (= "at one location at one moment", remember), and compared it to the multiple observations that people are recording for multiple locations around the globe, in an ongoing temporal listing of extreme records that continue to be set in a consistent pattern indicative of a trend, a change in said climate. Your third* logical fallacy was to presume that contemporary increases in climatic averages are somehow invalidated and not "real" if they do not exceed the historical extreme that you selected. What you are effectively doing is comparing the extreme end of a range with a mean. Anyone with primary grade numeracy should be able to understand that the mean of a parameter can change over time even if it doesn't in fact exceed an extreme historical value. If you want to properly invalidate all these contemporary observations you should take as many from your historical period as are being provided from the contemporary record, and you should include the same spacial scale of data. To compare you should consider their respective means, or the relative numbers and values of the extremes in each data set. So, now that you are armed with an explanation of the nature of some of your fallacious thinking, perhaps you can identify the exact fallacies in which you engaged, using the options in this list. I look forward to your successful indication of an understanding of where you went wrong in your thinking, and thus to congratulating you on your first step toward a more mature and educated capacity for reason. Thanks for all the replies (to this and my info about Julia Slingo) I'm not by my computer right now - sat in a station typing on a phone. When I'm back in front of a keyboard I'll get back to you. 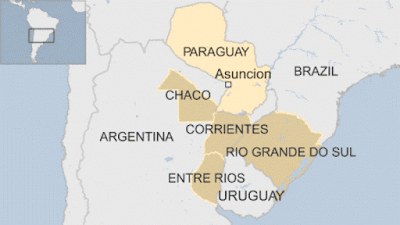 This is the third major flood in Paraguay in the last 18 months. I was in Asuncion last November, and at that stage almost every spare piece of ground (apart from soccer fields - some things are sacred) was occupied with temporary housing for people still unable to return home four months after that year's floods. It's also palpably obvious in Asuncion that it gets poorer the closer you get to the river, although this starts well above any plausible flood level so I think it probably has as much to do with staying away from mosquitoes (and the diseases they carry) as it does to do with floods. Thanks, Blair. I knew it had been bad there lately, but didn't realise just how bad. North Pole, 90° NL, tomorrow: thaw. My reply is on Sou's next post where I take a starring role. Essentially, I said that there really is nothing to worry about and the average person on the street couldn't care less about global warming as they have more important things to think about. Consequently, a load of other commenters got rather annoyed. Oh look, the guy with the fallacious logic is back. Have you figured out yet exactly which fallacies you committed, Andy Wilkins? Take it to Missouri where The Great Flood 1993 will become a mere stat. These polls demonstrate that Andy is wrong about the average person. "... where I take a starring role." The starring role is stupidity and deception. You don't think a denier can actually stop with denialisms, do you? It's what he is for.